Canada's Prime Minister Justin Trudeau shakes hands with French President Emmanuel Macron during a meeting in Trudeau's office on Parliament Hill in Ottawa, Ontario, Canada, June 6, 2018. On the eve of the G-7 summit in Canada, the U.S. president lashed out at host Justin Trudeau and the White House announced Donald Trump would skip some of the sessions. Trump also said Trudeau was being “indignant” about the cross-border trade relationship. Trump’s tweets came after Macron threatened to exclude the United States from the G-7 final statement to be issued in the mountainous tourism destination of Charlevoix. In his own tweets in French and English, Macron stated that while Trump “may not mind being isolated” the other six leaders meeting in Canada would also not mind signing an agreement among themselves. 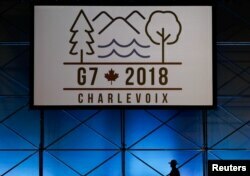 A Canadian mounted police officer walks past the Charlevoix G-7 logo at the main press center, ahead of G-7 Summit in Quebec, Canada, June 6, 2018. After the contentious salvos on social media and the Trudeau-Macron news conference, the White House announced Trump would depart the summit at 10:30 a.m. Saturday, following the session on women’s empowerment. "The president will travel directly to Singapore from Canada in anticipation of his upcoming meeting with North Korea's leader Kim Jong Un Tuesday. G-7 sherpa and deputy assistant to the president for international economic affairs Everett Eissenstat will represent the United States for the remaining G-7 sessions," White House Press Secretary SarahSanders said in a statement. Even before these developments, it had become clear that this would be one of the more contentious G-7 meetings in memory. Riot police arrest a protester at a march by demonstrators during the G-7 Summit in Quebec City, Quebec, Canada, June 7, 2018. Trump’s administration last week announced an end to exemptions from steel and aluminum tariffs that had been granted the Canada, the European Union and Mexico. Trump took the action on the grounds that weak domestic industries could affect U.S. national security. Canada, Mexico and the EU have separately announced retaliatory tariffs. The Trump administration has also been engaged in contentious talks with Canada and Mexico to renegotiate the North American Free Trade Agreement (NAFTA). Before arriving in Canada, British Prime Minister Theresa May called for fellow EU leaders to take proportionate responses to the U.S. tariffs and shrugged off a rebuff by Trump for a formal one-on-one meeting at the G-7. Other G-7 leaders may also choose to be less confrontational with Trump. President Donald Trump and Japanese Prime Minister Shinzo Abe shakes hands during a news conference in the Rose Garden of the White House in Washington, June 7, 2018. 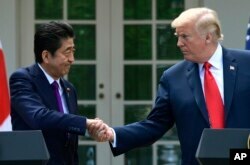 Japanese Prime Minister Shinzo Abe met with Trump at the White House on Thursday where the focus was Trump’s unprecedented meeting with the North Korean leader scheduled for Singapore next week. Italian Prime Minister Giuseppe Conte, a political novice, was just sworn in last Friday, leading a coalition of far-right and Euro-skeptic parties. He could turn out to be one of the friendliest faces for Trump at Charlevoix as his new populist government also stands for protectionist trade policies. G-7 or G-6 Plus One?